You are here: Home / Topics / Build More Power / Want To ADD Between 25 to 40-Feet Of Batted Ball Distance? I like this experiment better than the previous one that you showed.Your student sets up in the offset position the way Kenny G. did in his stance.Neither he nor your student counter rotate when they load their shoulders( scaps) so of course the slack is taken out of the system and the resultant study parameters will improve. 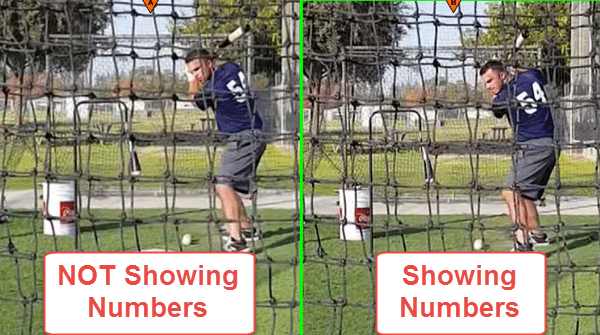 Their is a big difference between counter rotating the shoulders as the hitter strides versus loading the scaps from the offset position in the stance.One works well enhancing the parameters you measured while the other has results that are tless than optimal in many ways.i would suggest that the difficulty for the people at home is to understand and implement the difference between the two. Larry, who’s Kenny G.? You’re talking about two different things…showing numbers, which is counter-rotating the shoulders versus pelvis…and Scap row, which I call ‘Hiding the Hands’ from the pitcher. We weren’t testing the latter, and Preston isn’t doing that any different in these swings. The elbow you see peeking out on the ‘Showing Numbers’ swing is just the inward rotation of the shoulders. Sorry, I feel like I’m missing something in your comment. Larry what you said was very interesting and more importantly you got a Kenny G reference included (if it’s the Kenny G that I’m thinking of than it took me a minute to figure out what you were saying and damn you included a Kenny G reference that works… Pretty funny… Well done, if it’s who I think he is)… I think I know what your saying but just in case can you just add a little more so I’m certain… If I understand you correctly than I would just add keeping in mind that total power is important but PERHAPS efficiency in the system is more important and perhaps the systems are not identical as well… So is it possible that your implying that a move is viewed as all or nothing and if I’m right can we just have a head start without having to finsh or max it out..